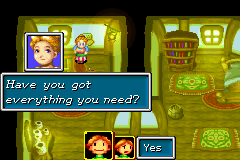 Previous: Golden Sun Walkthrough: Index Next: Childhood friends rush for safety. When you either start a new game or if you don't have any data to continue, you will be brought to this screen. At this point you may rename Isaac the main character of the game, however if you want to rename more characters there are two codes which allow you rename six additional characters. 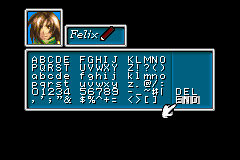 If you press select three times you will hear a chime and this will allow you to rename Garet, Ivan and Mia (These are the Characters you get to control in this game). This is done by pressing up, down, up, down, left, right, left, right, up, right, down, left, up, and select. Again you should hear a chime that lets you know the code was successful. We start the game with the Isaac’s mother trying to wake up her son. Currently residing in a village named Vale there is a large Boulder that falling towards the town which is why the town is being evacuated. 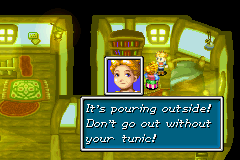 Once Isaac wakes up, Dora (Isaac’s mother) takes his tunic and leads him out. 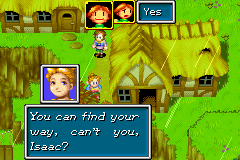 Before going downstairs Dora asks if Isaac forgot anything , unfortunately most yes or no questions in this game have nearly no effect on game play except for what immediate response you might get. This is no exception she just makes you go downstairs anyway. After you get downstairs Isaac’s Father (Kyle) says the boulder will fall in any minute, this leads to your rush outside. Kyle states that the boulder can’t be stopped and that Dora and Isaac should seek refuge in the Plaza. Dora asks why isn’t Kyle coming and Kyle replies that he needs to help evacuating the other villagers. Dora insists on helping her husband evacuate the other villagers and asks you if you can find your way to the plaza and you have to answer yes to this question, otherwise she will keep asking.